About 14 million people eat out at restaurants during Thanksgiving. Maybe these people don’t feel like cooking, or perhaps they’re staying away from their families. We have a hunch that many of them are just trying to avoid disasters like the ones you’re about to see. 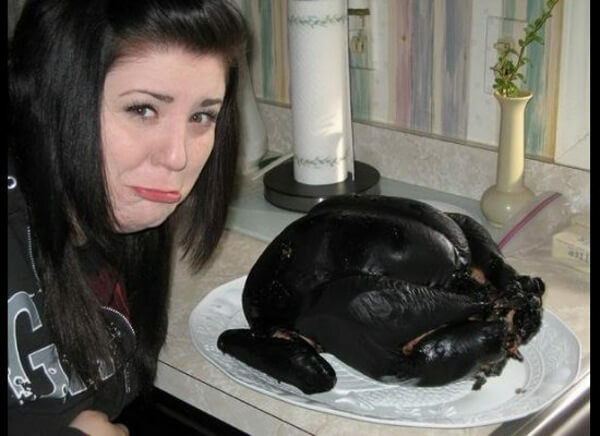 You will laugh out loud at some of the Thanksgiving dinner fails that have been caught on camera. Don’t let these Turkey Day tragedies happen to you! More and more people are going out to dinner on Thanksgiving because of things like this. Some people can’t cook! Whether it’s because they’ve never cooked a turkey before or they set the temperature wrong on the oven, we’re not sure. But nobody wants to eat a bird that looks like this. In fact, consuming burned food is not healthy. Of course, if you’re really desperate you could always scrape off the burned skin and try to eat the meat underneath. However, it’s likely that the meat will be rather dry. The solution? Smother it in gravy and try not to think about what you’re eating.